In October of 1999 J.K. Rowling, author of the best-selling Harry Potter books was on a book tour in the U.S. Diane had a chance to talk with her while she was in Washington. J.K. Rowling’s books and the movies based on her books have become international sensations with fans of all ages. In this hour Rowling talks about how the Harry Potter story began in her imagination and how she hoped it would become “a little book a few people might like.” Please enjoy this conversation with writer J.K. Rowling, the creator of the Harry Potter series. MS. DIANE REHMFrom WAMU in Washington, I'm Diane Rehm. 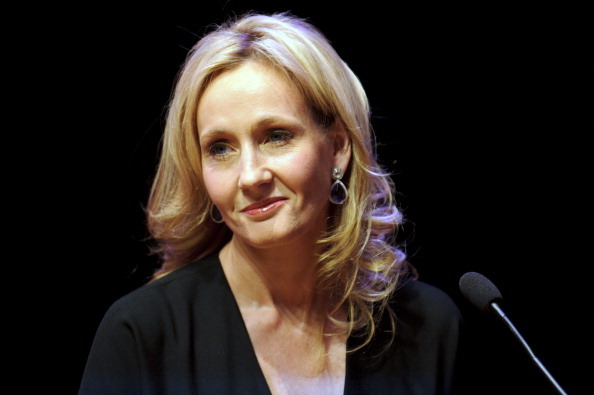 Joanne Rowling grew up in Britain's Forest of Dean. She was always an avid reader and dreamt of one day becoming a writer herself. Today, she's known to millions of kids around the world as J.K. Rowling, the name on the jackets of her bestselling series of books about a young wizard in training called "Harry Potter." Joanne Rowling joins me to introduce her young creation and to talk about how his success has changed her life. MS. DIANE REHMThroughout the hour, we'll take your calls no matter how old you are, 1-800-433-8850. And good morning to you, Jo. I'm glad to have you here. MS. J.K. ROWLINGGood morning. Lovely to be here, thank you. REHMYou've had quite a time here in Washington and perhaps all over the world, truly. I mean, the lines waiting outside for you to sign books at a bookstore here in Washington. Politics and Prose, they had to turn people away. ROWLINGYeah, it was -- that was a really nice event. I really enjoyed it yesterday. REHMNow, I want to ask you, Jo. Did you, at any point, as you were writing -- I know you believed in what you were doing, but did you expect anything like this kind of reaction? ROWLINGI would've been crazy to expect this. No one could've expected this. I thought I was writing a little book that a few people might quite like. That's what I thought. I loved it. You know, I really passionately believed in Harry. I was really -- and I am really proud of him, but I never expected it to have this kind of appeal. REHMWhen did you first come up with the idea of Harry Potter and how? REHMWhat do you mean, the idea? ROWLINGThe basic idea -- Harry -- I saw Harry very, very, very clearly. Very vividly and I knew he didn't know he was a wizard. So I see this skinny little boy with black hair and green eyes and glasses and patched up glasses, you know. They've got Scotch tape around them holding them together. And I knew that he didn't know what he was. And so then, I kind of worked backwards from that position to find out how that could be, that he wouldn't know what he was. ROWLINGAnd at the same time, I'm thinking, well, he's going to go to wizard school and that was when it really caught fire for me. I got really excited at the idea of what wizard school would be like. REHMHe's got a scar on his forehead. ROWLINGUh-huh, he's got a lightning-shaped scar. REHMNow, what is that from? ROWLINGThat’s when he was one-year-old, the most evil wizard for hundreds and hundreds of years attempted to kill him. He killed Harry's parents and then he tried to kill Harry. He tried to curse him. ROWLINGI can't tell you. That's the $64,000 question. I can't tell you. Harry doesn't know yet. I'm -- Harry has to find out before we find out. And so -- but for some mysterious reason, the curse didn't work on Harry so he's left with this lightning bolt shaped scar on his forehead and the curse rebounded upon the evil wizard, who has been in hiding ever since. REHMHow does Harry find out he's really a wizard? ROWLINGThe Dursleys. And they're what wizards call Muggles, meaning that they're completely non-magical. And the pair -- Mr. and Mrs. Dursley are aware of what Harry is, but they've never told him what he is. They've kept it hidden from him. ROWLINGBecause a letter was left for them when Harry was taken to them as a baby, explaining everything that had happened. So towards Harry's 11th birthday, letters start arriving mysteriously for him, which he's not allowed to read and they're letters from Hogwarts School of Witchcraft and Wizardry telling him he's got a place and he's to go to Platform 9 3/4 at Kings Cross Station on September the 1st and board the train. ROWLINGAnd goes to Hogwarts, yeah, when his adventures really start, predictably. So he's learning all sorts of different kinds of magic and a lot of stuff goes wrong. He makes two great friends, Ron and Hermione, and then he has to start facing his -- well, really, he has to start facing his past. He has -- he starts finding out what really happened and he has to start facing what that means because he's been born to shoulder a certain burden. REHMSo there's a certain morality. ROWLINGI think so, yeah, yeah, definitely is, yeah. REHMIn these tales. Why do you think young children are so drawn to these books? ROWLINGThat's such a very hard question to answer because without being disingenuous, I wrote what I wanted to write and wrote the sort of thing that I knew I'd like to read, I'd like to read now as an adult. And I knew that I would've liked to have read it when I was 11. And in a sense, I'm too close to it to be able to see whether there's, you know, a particular thing that draws children in. And in many ways, I don't want to analyze it too much because I'm scared that if I decide that it's factor X that is making children in these numbers like it, I might try a little too hard to put a lot of X in book four or five and I don't want to do that. ROWLINGI just want to write it the way I'm writing it in the moment and enjoy writing it and do it my way without trying to, you know, work to a formula. REHMBut what have children told you? ROWLINGChildren, lots of different things. The main thing, I would say, the overriding thing is that they really love the characters. They very much seem to think of them as real people. They implore me constantly, don't kill so-and-so. I really like Washington because in Washington, I've met the highest number of people ever who have said don't kill Hermione, who is Ron's -- who is Harry's best female friend. And I have to say, most people just don't really care about Hermione in the sense that they think she's too clever and she'll get through it somehow. ROWLINGBut I like Washington 'cause Washington will stay in my mind as the place where people really thought Hermione needed a bit of backup. REHMJ.K. Rowling, she's the author of the "Harry Potter" series of books, published by Scholastic. "Harry Potter and the Sorcerer's Stone," "Harry Potter and the Chamber of Secrets," and "Harry Potter and the Prisoner of Azkaban." And if you'd like to join us, 1-800-433-8850. I'll look forward to hearing your questions, comments. Why don't you read for us just a little bit, Jo. ROWLINGI'm going to read a really short piece here. ROWLINGThis is from the first book, "Harry Potter and the Sorcerer's Stone," and Harry goes shopping and one of the most important things he has to buy is, of course, his wand. So he's gone into the wand shop, which is owned by a man called Mr. Olivander and Mr. Olivander is about to teach him about wands and about what you need to choose your wand. "'Well, now, Mr. Potter. Let me see.' Mr. Olivander pulled a long tape measure with silver markings out of his pocket. 'Which is your wand arm?' 'Uh, well, I’m right-handed,' said Harry. ROWLINGHarry suddenly realized that the tape measure, which was measure between his nostrils was doing this on its own. Mr. Olivander was flitting around the shelves taking down boxes. 'That will do,' he said, and the tape measure crumpled into a heap on the floor. 'Right then, Mr. Potter. Try this one. Beachwood and dragon heartstring, 9 inches, nice and flexible. Just take it and give it a wave.' Harry took the wand and, feeling foolish, waved it around a bit, but Mr. Olivander snatched it out of his hand almost at once. ROWLING'Maple and phoenix feather, 7 inches, quite whippy. Try.' Harry tried, but he had hardly raised the wand when it, too, was snatched back by Mr. Olivander. 'No, no. Here, ebony and unicorn hair, 8 1/2 inches, springy. Go on, go on, try it out.' Harry tried and tried. He had no idea what Mr. Olivander was waiting for. The pile of tried wands was mounting higher and higher on the spindly chair in the corner, but the more wands Mr. Olivander pulled from the shelves, the happier he seemed to become. ROWLING'Tricky customer, eh? Not to worry. We'll find the perfect match here somewhere. I wonder now. Yes, why not? Unusual combination. Holly and phoenix feather, 11 inches, nice and supple.' Harry took the wand. He felt a sudden warmth in his fingers. He raised the wand above his head, brought it swishing down through the dusty air and a stream of red and gold sparks shot from the end like a firework throwing dancing spots of light onto the walls. Hagrid whooped and clapped and Mr. Olivander cried, 'Oh, bravo. Yes, indeed. Oh, very good. Well, well, well, how curious. ROWLINGHow very curious.' He put Harry's wand back into its box and wrapped it in brown paper, still muttering, 'Curious, curious.' 'Sorry,' said Harry, 'but what's curious?' Mr. Olivander fixed Harry with his pale stare. 'I remember every wand I've ever sold, Mr. Potter, every single wand. It so happens that the phoenix whose tail feather is in your wand gave another feather. Just one other. It is very curious indeed that you should be destined for this wand when its brother, why its brother gave you that scar.'" There we go. REHM...to whom these books appeal. ROWLINGI do get a lot of letters from adults in increasing numbers, yeah. REHMYeah. I would imagine so. It seems to me that what you've achieved is to create that kind of excitement in a book that, say, for American children mostly video and film does. But here, you've managed. ROWLINGI met a really nice boy yesterday here in Washington who said to me, when I'm reading, it's like there's a video playing inside my head. ROWLINGAnd I said to him, that's one of the best things you could say to me because obviously you can visualize it really, really clearly. I mean, that's your aim. That's your aim as a writer. You want people to be in there living it. REHMWhere did, for you, the process of learning to write begin? ROWLINGIt began when I was about 6, when I finished my first story and I thought it was a book and I couldn't understand why my parents weren't going to get it published for me. But when you're 6, you know, you think like that. You have that unshakeable confidence which you never get back. That story was about a rabbit called "Rabbit Who Got The Measles," and was visited by his animal friends. And I've been writing ever since. It's all I ever wanted to do. REHMWhat -- how did your parents react? They wanted you to do something else. ROWLINGYeah. Well, I never said to them directly. I never really -- I said to people when I was a bit older, close friends, I said that was what I really wanted to do, but I never said to my parents, point blank, all I want to be is a writer because I just -- I felt very self conscious about saying that and I came from a family where no one else was a writer or did anything particularly artistic. And I think they would've been worried. They would've thought, well, that's quite an unrealistic hope. ROWLINGAnd in a way, they would've been right. You know, most writers, the vast majority of writers, do not make enough money from their writing alone to support themselves and a family. ROWLINGSo I think I could've said it to them and they would've said, well, that's great, but make sure you have a second string to your bow. REHMSo how did you make your living initially? ROWLINGWhen I was living abroad, I was teaching English to very small children up to adults, up to grandmothers, but mainly teenagers. Teenage is my favorite age group to teach. And then, in Scotland, I was teaching French in the equivalent of your high school. So, again, I was teaching teenagers. REHMSo you were really driven to write. ROWLINGYeah, very driven. Yeah, yeah. ROWLINGAbsolutely. And I know that if I had never been published now, I'd still be doing exactly the same thing. REHMWe'll take just a short break here and when we come back, we'll try to open the phones, 1-800-433-8850, as I talk with J.K. Rowling about her very, very popular series on young Harry Potter. 1-800-433-8850. I'm Diane Rehm. Stay with us. REHMAnd if you've just joined us, we have a real treat this morning, having J.K. Rowling with us. She is Joanne Rowling, the author of the "Harry Potter" series, three books that have ignited young and adult readers all around the world. If you'd like to join us, 1-800-433-8850. What age group are you actually aiming for, Jo? ROWLINGWhen I'm writing, I don't aim for any age group. I write these books entirely for myself. And, in fact, before my British publisher, Bloomsbury, told me that they were going to market the books as for 9 years and above, I really had no idea. A vague idea, obviously. I mean, I was aware they weren't for 3-year-olds and I knew that probably 19-year-olds would be wanting to read other stuff, although I've met quite a few 19-year-olds since. So that's a really nice thing. ROWLINGBut optimum age, I'd definitely say was 9 plus for these books. REHMIs there a certain amount of very sophisticated mythology that you're trying to work in here? ROWLINGThere is -- I'm not trying to work it in, but if you're writing a book that -- I mean, I do do a certain amount of research and folklore is quite important in the books. So where I mention a creature or a spell that people used to believe genuinely worked -- of course it didn't, but that's, you know, it's still a very picturesque and a very comical world in some ways, then I will find out exactly what the words were and I will find out exactly what the characteristics of that creature or ghost was supposed to be. ROWLINGBut I hope that that appears seamlessly. Children often, often ask me how much the magic is (word?) is real in the books in the sense that did anyone ever believe in this. I would say a rough proportion, about a third of the stuff that crops up is stuff that people genuinely used to believe in Britain. Two-thirds of it, though, is my invention. REHMHmm. What about words? You seem to have just a marvelous facility to make words, to create words. ROWLINGI love making up words. There are a few key words in the books that wizards know and Muggles, as in us, no magic people, don't know. Well, Muggle is an obvious example. Then, there's Quidditch. Quidditch is the wizarding sport. A journalist in Britain asked me, she said to me, now you obviously got the word Quidditch from quiddity, meaning the essence of a thing, it's proper nature. And I was really, really tempted to say, yes, you're quite right because it sounded so intellectual. ROWLINGBut I had to tell the truth, which was that I wanted a word that began with Q on a total whim and I filled about, I don't know, five pages of a notebook with different Q words until I hit Quidditch and I knew that was the perfect one when I finally hit Quidditch, yeah. REHMSo that's how you look for words, coming out of yourself just writing again and again. ROWLINGYeah, you just keep trying and yeah, yeah, fill side to sides of paper till you get the right one. REHMIt's sort of like painting a landscape. ROWLINGIn a way, yeah. Broad strokes and fine strokes, yeah. REHMThis idea of wizardry, the idea of people actually dying. How scary do you regard that to be for young people? ROWLINGPrecisely. And these are folk tales and folk tales are generally told for a reason. They are ways for children to explore their darkest fears. That's why they endure, that you have archetypes. You have a wicked stepmother, this threatening figure who should be nurturing and who isn't. So these images crop up again and again and again. If you read Grimm's fairytales in the original, they are very brutal. ROWLINGAnd, in fact, I think more frightening that anything I've written so far. I mean, children being murdered, it's -- they're a horrible thing. But this is centuries back and I don't think children have changed that much. I think they still have the same worries and fears and literature is an excellent way because they have to bring their own imagination to it so this is something they really participate in when they create the story inside their home head, after reading it on the page. ROWLINGIt's a fabulous way to explore those things. Now, I don't set out thinking this is what they're going to learn in this book, ever. I have a real horror of preaching of anyone or of trying to make, you know, enormous points, you know. I'm not driven by the need to teach children anything, although those things do come up naturally in the stories, which I think are quite moral because it's a battle between good and evil. But I do think that to pretend to children that life is sanitized and easy, when they already know. They don't need me to tell them that life can be very difficult. ROWLINGIf it hasn't happened in their own family, then one of their friends father's will be dying or some -- you know, they're in contact with this from a very early age. ROWLINGAnd it's not a bad idea that they meet this in literature. ROWLINGAnd it's not a bad idea that they can see a character who is -- I mean, Harry is a human boy who makes mistakes, but I think of him as a very noble character. He's a brave character and he strives to do the right thing. And to see a fictional character dealing with those sort of things, I think, can be very, very helpful. REHMNow, Jo, you know that there is talk of banning these books. REHMThere is a question in the minds of some library boards of directors as to whether these books should be on the shelves because they do involve witchcraft in the minds of those superiors. They do involve killing. They do involve some frightening things, as you've just outlined. What's your reaction to that kind of controversy? ROWLINGFor me, it's very simple. Of course, parents have a perfect right to decide what their children see or read. I do not feel, however, that they have the right to decide what all of our children see and read. That's something different. So that's my position. If anyone doesn't want to read the books, they -- of course, don’t read them. But to stop other people reading them, I think, is very unfair. ROWLINGI would -- yeah, I have a problem with that aspect. No book is going to be for every child and no book is going to be greeted with open arms by every parent. My feeling is that if we ban every children's book that makes mention of magic or witches or wizards, we are going to be -- what are we going to be doing? Removing three-quarters of the children's classics from the bookshelves. REHMDo you feel, yourself, drawn, in any way, to witchcraft? ROWLINGA children's -- no, not in the slightest. Children ask me, of course, they -- do you believe in magic and I have always said, no, I don't. I believe in different kinds of magic. There's a kind of magic that happens when you pick up a wonderful book. ROWLINGAnd it lives with you for the rest of your life. That is my kind of magic. There is magic in friendship and in beauty and metaphorical magic, yes. But in the sense of do I believe that if you draw a funny, squiggly shape on the ground and dance around and it's something -- not at all. I find the idea, frankly, comical. REHMAll right. We've got lots of callers. REHMWe'll open the phones now. 1-800-433-8850. First, to Ginger in Jacksonville, Florida. Good morning. GINGERGood morning. Ms. Rowling, can you hear me? GINGEROkay. First of all, I love your books. GINGERThey're (unintelligible) I've been listening to you talk this morning and I know you were talking about children and what they see in the real world. But I remain upset and disappointed by a report that I read in the newspaper that in book 4, that you felt the need that somebody -- that somebody needed to die, to be killed by He Who Must Not Be Mentioned, Voldemort. GINGERAnd I want to ask you why because our children know what the real world is and this is such -- that your book are such an inspiration to the imagination. ROWLINGI didn't read that piece, but it has been -- I'm not going to say that no one's going to die in the books, that -- I'm not going to say that. But to say that I felt the need to kill someone just for the fun of it is just completely false. I don't want to be doing that for no good reason. I do sometimes get letters expressing these kind of views, people saying, well, I really love your books, but I don't want you to do this. Well, I'm -- I don't want to -- I'm not in the business of setting out to offend anyone. I don't want to upset anyone. ROWLINGAbsolutely, they wholeheartedly -- they love the characters. Now, that is the best thing that could happen. For five years, I was writing about these characters. No one read a word about it. Can you imagine what it feels like to me to see a huge queue of people who all know Harry and Ron and Hermione and Hagrid, these characters who lived with me for five years and no one knew about them. It is still -- and on the other side of the Atlantic. ROWLINGIt's the most wonderful thing to me. I totally appreciate that people feel a very personal interest in these characters. But I still have to be able to write them the way I always planned to write them. You know, they've been plotted carefully since 1992, the larger plot has been in place. GINGERHave you had all seven books plotted out, the outline? GINGEROh, you did. So you didn't write one or two and then as they became popular, then write the rest. ROWLINGNo, no. Not at all. I always planned that we would see Harry from starting at Hogwarts to finishing at Hogwarts, which is, in my world, wizards come of age at 17, age 17. So in book seven, you will see Harry come of age, which means he's allowed to use magic outside school and you will see the end of that school year. So it will be seven years in his life. GINGERWell, I'll be disappointed if they end at book seven. ROWLINGThank you, thank you for saying that. REHMJo, you've lost some loved ones in your own life. REHMHow has that affected your thinking about what children know, what they don't know? ROWLINGWell, it's affected me profoundly, obviously, and therefore it's in the books. This -- I mean, that -- I lost my mother. I lost my mother at age 25. And that and the birth of my daughter were the two most life-altering, character-changing things ever to happen to me. Nothing before or since has ever affected me in the way that those two things did. I do not, at all, regard with glibness the prospect of killing even a fictional character, not at all. There's a part of book one where Harry sees his dead parents in an enchanted mirror. ROWLINGI was quite take aback when I reread that chapter to see how much I had directly given Harry my own feelings because I wasn't aware of that as I was writing. As I was writing, I'm trying to do the thing properly. I need -- that needed to happen for plot reasons. If people have read the book, that they will know Harry had to find out how that mirror worked. But when I reread the chapter, it became very clear to me that I had given Harry almost entirely my own feelings about my mother's death. ROWLINGFor the first time. He cannot remember what they looked like. They died when he was 1-year-old. REHMAs perhaps you longed to see your own mother. ROWLINGI think we all do. I think that's very common. ROWLINGI've met many, many, many people now who have said that that chapter moved them because you do have this appalling thirst just to see them again. And it would never be enough, but that point is made in the book. You know, Harry has this obsession with returning to the mirror, to keep staring at his parents. Ultimately, it's not healthy. You do have to let go. And they would want you to let go. You know, this is a very important point. REHMI can truly identify with what you've said, since both my parents died when I was 19. ROWLINGOh, I'm sorry. That's very young. REHMMy mother was 49. My father 62. REHMSo I know exactly what you mean. At 25 before the hour, you're listening to "The Diane Rehm Show." And we'll take another caller. Let's see, 9-year-old Sam at Landon School here in Bethesda, Maryland. Good morning, Sam, you're on the air. And perhaps you know that my own son went to Landon School in Bethesda. Sam, are you there? ROWLINGGood. Have you got a question? REHMDo you have a question? SAMYeah. Why did you start to write books about Harry Potter? ROWLINGWhy did I start to write the books about Harry Potter? There's a really good reason why, Sam. I'd had other ideas for books, many ideas for books before then and short stories and poems and I'd written all sorts of things. This was the first idea that I had that gave me a kind of physical sense of excitement. Like, you know how when you get really excited about something, your stomach turns over. That is how I felt. The moment I had the idea, I -- just excitement flooded through me and adrenalin flooded through me. ROWLINGAnd I think that's -- you can normally tell a good idea by that kind of very physical response to it. I was so excited. I just thought this would be such fun to write and that's really what gave me the impetus to keep writing about him. REHMGood. Sam, thanks for calling. REHMAll right. Let's go to Cincinnati, Ohio, and to Celeste. Good morning. CELESTEI'm just -- I have, actually, two questions. CELESTEOne of them is if in Quidditch, if Ravenclaw was playing Hufflepuff, if Ravenclaw's seeker caught the snitch, but Hufflepuff was still ahead of them in points because of how many goals they scored, who would win? ROWLINGWell, it is -- right. For people who haven't read the books, Celeste has proven herself a true fan by asking a really technical question about Quidditch, which is the wizard sport. Okay. So I'm going to answer it for Celeste, but this will be completely impenetrable to a lot of people. It's possible, Celeste, for the team to win even if they don't catch the snitch, but they have to be more than 150 points up on goals. ROWLINGOkay? So that can happen. And it does happen at -- this makes me sound completely insane that I know all this stuff, but of course, I would. It's my world. It happens more at the higher levels of Quidditch when the goal scoring is a bit higher. ROWLINGSo that's what normally happens, but it's -- in school Quidditch, normally if you catch the snitch, you'll know you win. That's normally what happens. CELESTEAnd I'd also like to know, a friend of mine told me that you'd heard that they were going to make a movie. ROWLINGThat's -- yes, that's true. The film rights have been sold and at the moment, as far as I know, the movie should be made in -- or finished and ready to watch summer 2001. ROWLINGOkay? Thanks very much for calling. REHMThank you. How do you feel about that movie business? ROWLINGI feel really excited, mainly, in fact, coincidentally because Celeste has just asked about it, because of Quidditch because I've been able to see this game playing in my head for years now and to actually -- to imagine being able to watch it, literally watch it, would be the most fabulous thing. REHMBut doesn't it take it into a different realm? ROWLINGYes, it does. Of course, it does. So I -- yes, I'm very excited and, of course, I'm nervous. There's not an author in the world who cares about their characters who isn't nervous when it is taken on to the big screen. But I must say that I never would've sold film rights to Warner Brothers if I hadn't believe that they would make the best job of the film and if they do what they say they're going to do, I do truly believe it will be a great film and that's what matters. ROWLINGAnd I would rather make, you know, have it made with people who are giving me some input and, you know, I'm able to express my views and they're very open to hearing what, you know, what I feel about it, then obviously having it made by someone perhaps after I've been hit by a bus, when I have no say at all and it's not done the way I'd like to see them. REHMBut how much final control do you actually have? ROWLINGWell, we're at a very early stage here. I have script approval. The script's not even finished yet. ROWLINGWarner Brothers have been very keen to ask my views on all sorts of things. They got a really great writer, Steve Kloves, which I couldn't be happier about. He would've been my first choice. He has a very similar sense of humor to me. He really gets the books. He really likes Hermione, which is not that common. So we're okay there. So, so far, I'm really happy. REHMAll right. We'll take more questions, comments after a short break, 1-800-433-8850. I'm Diane Rehm. Stay with us. REHMAnd welcome back. J.K. Rowling is with me, the author of the extraordinarily popular Harry Potter series of books, published by Scholastic Publishing in New York. And the first three are out and in front of me. I know we have both many young fans and adult readers. One reader Marty, who calls himself an adult reader, he says he loves the books but finds it hard to accept that they are actually for children. ROWLINGWell it's an interesting point because I never saw them as, you know, exclusively for children ever. As I've said, I was 30 when I finished Book One. I'm now 34. I'm still writing what I know I'd like to read now. But I am aware that I would've liked to have read it when I was much younger. If -- it depends what Marty means. I mean, certainly the sense of humor is mine. It's not what I think kids find funny, it's what I find funny. So yes, I'm writing for anyone who wants to read the books, anyone at all. I hope that answers the question. REHMYou finished the first book when you were 13? ROWLINGOh I wish I'd finished it when I was 13. I wish I had. ROWLINGNo, 30. I started writing it when I was 25. ROWLINGBut during those five years I was working fulltime, so I had limited -- well for four of those years I working fulltime. One of those years I was being a single mum fulltime, which was actually harder work. REHMYes, now talk about your marriage, your divorce and your child. ROWLINGWell, basically my marriage split up. I had been living and teaching abroad. ROWLINGIn Portugal, yeah. Moved back to Scotland to be near my sister and obviously moved back to a life where I had no job, and we didn't have very much money. For about a year we really didn't have very much money at all. ROWLINGWell, it meant gross insecurities. Anyone who's been there will know that the main worry is the stress of having very little money and having a child and the guilt feelings about, you know, am I ever going to be able to provide property for her. I've got -- you know, I really want to get out there and work again. But as countless mothers all know, here and in Britain, you do get stuck in a kind of trap. You -- childcare is expensive. You need to get a job that pays really a lot of money to be able to afford the childcare so you can work. ROWLINGSo you're caught in this kind of vicious circle. But after about a year, I got out, and I was teaching again, and life, you know, became a lot more secure, not frantically secure because I wasn't teaching fulltime at that point. The irony is I never, ever thought the books would be financially viable. I had huge guilt feelings about my desire to write because I thought is this very self-indulgent, this is my passion, but I have a daughter to look after now. ROWLINGAnd my realistic -- well, my very hopeful ambition was that the book would make just enough money -- it would kind of pay for itself, if you see what I mean, even if it just kept me in typing paper and typewriter ribbons. REHMSure, because you were so driven to write. ROWLINGAbsolutely, and I just thought if I could just say, well, you know, it made 2,000 pounds, which to me at the time actually was a lot of money, if I could just say that, then I thought I can justify taking a part-time teaching job and writing part time. But I really felt that it had to make me something because otherwise I felt I was selling out my daughter. REHMSo now it's all different. ROWLINGVery different because now I can afford to write fulltime, which was my lifelong ambition. I never, ever dreamt I would be able to get here. It is just -- I still -- I very frequently feel I'm going to wake up and think I had this dream where I was touring America, and there were people queuing. REHMHow does it change your life? ROWLINGIt's a very -- it's a weird thing because on some levels, my life hasn't changed at all. People might find that hard to believe, but I am -- I'm still a very happy single mother, I'm still doing all the mundane stuff, I'm still, you know, making the tea and cleaning out the rabbit and writing at home, not a glamorous existence but the existence I always wanted. So on that very basic level, day to day, my normal life has really not changed very much except that there is an absence of worry. That's the big thing. I don't worry about money anymore. ROWLINGWell, I do still worry about money because I think it will all go away. ROWLINGYou know, I haven't got used to the idea that I don't have to worry. ROWLINGBut then I come to America for three weeks, and it's like stepping through the looking glass, and suddenly I go from this very quiet existence, where I'm -- it's me and my notepad in some obscure café somewhere writing to this, to being interviewed on the radio. And so obviously that is a very big change. That didn't use to happen at all. ROWLINGI feel stunned by the warmth of the response, I really, really do. But it's a wonderful. Overwhelmed implies that I'm not enjoying it, that I go home to my hotel room, and I cry. No, I don't. I feel shocked but in the best sense, you know. REHMYes, I know the feeling. ROWLINGI do feel shocked. You know, it's like walking into a wall of -- I mean, I went -- to walk into a bookstore and have children applauding and screaming, you know, and you're looking over your shoulder wondering which Spice Girl turned up, and then you realize it's for a book, that's the best thing in the world, nothing better than that. And it's absolutely fabulous. ROWLINGWell my daughter, she's -- I'm prouder of her than I am of the Harry books, and that's really saying something. She's absolutely great. But she -- for her, it's a funny thing because she can't ever remember life being very different. She was obviously very tiny when we were really broke, has no memory of that period at all, which is a nice thing. She's always seen me writing. She's always been used to me saying just hang on, hang on two seconds while I write this down, hang on, mummy's just got to write this down. So that's just something she's had to put up with from mummy. ROWLINGIt was only when she started school that she for the first time realized that what I did was not completely usual because then a lot of older children in the playground were surrounding her, saying does your mum really write the Harry Potter books because they were reading them in school in Scotland. ROWLINGIt's being read in a lot of classrooms. So that -- then for the first time she was coming home and sort of asking me what was going on. ROWLINGI've read the -- very recently. I swore I wouldn't read them to her until she was seven, but she badgered and badgered and badgered me, and finally I decided it was almost unfair to shut her out because, you know, it was best for her to understand what all these children are asking all the time. So I read her the first one, we're currently on Book Two, and she really loves it. REHMAnd you're reading out loud to her. How wonderful. ROWLINGI read them out loud to her. She can read them herself. ROWLINGI mean, I sat and listened to her the other day, and I was in tears. REHMNow will you be reading these for tape? ROWLINGNo, I'm -- I really hate the sound of my own voice on tape. So I was asked to in Britain, and I just said I couldn't bear to do it. In Britain, the British version is read by Stephen Fry, who is an idol of mine, I've idolized him since I was in my teens. So meeting him was quite something. And to hear him read my book was amazing. You know, he's a very, very funny man. He's fantastic. ROWLINGAnd here in America, the American version of the tape is read by Jim Dale, and I heard that very recently, and I loved it just as much, so yeah, I'm really pleased with them. REHMAll right. Back to the phones and to Ann Arbor, Michigan. Let's go to Laurie. You're on the air. LAURIEI, first of all, want to say that I'm the mother of an 11-year-old girl, and she forced me to read these books. LAURIEBut I am enthralled. They are just wonderful, and I really suggest that any parent whose child is reading these books that they need to read these books also. They are just wonderful. LAURIEThey're delightfully imaginative, and I would just die if I could play Quidditch. I just love Quidditch. It's wonderful. But I do have a question. I'm always interested when female authors choose males as their protagonist. LAURIEAnd I'm wondering if you even know, Ms. Rowling, why when you were on that train, and the picture of Harry came into your mind, why he was a boy, a 10-year-old boy, and not a girl, if you've given any thought to that. ROWLINGI have. That is actually very, very astute of you because no one's ever -- I've been asked that question before, but never phrased that way, and you say why you even know, and that's it. No one -- I mean, I don't know why that -- why Harry came to me. No, I don't know why it was a boy. And -- but have I given thought to it? Yes, definitely. I've been writing a book for six months, and I did suddenly stop. I mean, it took me six months because I was enjoying myself so much, to suddenly stop and think hang on, I'm obviously female, and I -- my hero is a boy. How did that happen? ROWLINGBut it was too late. It was too late then to make Harry Harriet. He was very real to me as a boy. I would have -- you know, to put him in a dress would've felt like Harry in drag. I couldn't -- I was too fond of him by then to go and turn him into a girl. So I think you -- again it's a freedom issue. You have to be free to write what you want to write. I'm not in the business of putting token characters in there because I think okay, now today we need, you know, this kind of a character. I never do that. ROWLINGMy characters come organically, and they come through this mysterious process no one really understands. They just pop up, or they're sometimes inspired by real people. Hermione is -- Hermione, Harry's friend Hermione, is really the brains of the outfit. Anyone who's read the books will know that. And she is a caricature of me at 11. ROWLINGNow Harry -- Hermione is very, very dear to my heart because of that. I understand her implicitly. She's not exactly like me because characters always become something very different on the page. So I do feel that I have a female character in there, into whom I've already put a lot of myself. REHMI think the experience, Laurie, of reading the books with your child is really going to establish a bond that probably will last for the rest of your lives. REHMSomething -- something that really draws you close together and creates memories, very special ones. ROWLINGIt's the nicest thing I could hear, the best thing, because reading aloud is so important. REHMAt seven minutes before the hour, you're listening to "The Diane Rehm Show." And let's go to St. Louis, Missouri, Jerry, thanks for joining us. JERRYWell thanks for taking my call. JERRYAll I wanted to say, I got the first book when I heard about it on NPR about a year ago, when it first came to the States, for my wife, and read it of course myself. And we both have enjoyed it and look forward to reading the rest of your book. ROWLINGOh thank you so much. JERRYAnd our reading group that we read a book each month is going to read the first book in November. REHMAnd this is, I presume, an adult reading group. JERRYYou're doing a signing tour, apparently. Are you going to be anywhere in the St. Louis area? ROWLINGAm I going to be anywhere in the St. Louis area? ROWLINGYeah, it's -- we're moving to Atlanta today and then Chicago. ROWLINGThen Los Angeles and then San Francisco. ROWLINGMaybe next time, yeah, definitely. REHMThis whole phenomenon here in this country, I recognize that you didn't expect any of it. But are you surprised at especially the United States? ROWLINGI was, and yet when I look back, I think well, why were you. The first reading I ever did in the States, which was this time last year, I remember feeling incredibly nervous in the car on the way there. I was going to speak to about 50 children. And I was thinking in the car, if I were about to speak to 50 British children, I wouldn't be that nervous because I know where the laughs come. I knew the reading I was doing, I knew always where they laughed, the kind of questions they answered. ROWLINGAnd I was thinking but this feels like unknown territory. I started the reading, at the point where I would have got the first laugh in Britain, I got a huge laugh, and my nerves completely disappeared. ROWLINGKids are kids everywhere. And I have exactly the same kind of response over here, and so now I look back and think, well, how stupid were you, why would it have been different, you know. REHMYou've got the last chapter of the seventh book. ROWLINGYeah, of the seventh book written. ROWLINGWhich I'm now starting to think I should put in a safe. I mean friends of mine joked to me about that when I started telling it. They said, you know, you want to be careful because what if a fanatic came round the house and found it. And I would just laugh about it. And kids, friends of mine, kids have come around and joked and pretended to, you know, get in the study and look for it. ROWLINGAnd I have actually hidden it now because, I mean, it would be an absolute just disaster if anyone read that before it was published. So yeah, it might have to go in a safe. REHMWell, I am so delighted for your success. REHMI am so delighted that you have turned so many young people on to reading. ROWLINGThere is nothing, nothing better than that. There is no higher compliment, and I have met very many parents in Britain and here now who have said oh, he wouldn't read, or she wouldn't read. ROWLINGAnd that is the absolute highest compliment and makes me feel that I wasn't wasting space on this Earth after all. REHMJ.K. Rowling, and she is the author of the enormously popular Harry Potter series. I want to thank you so much. REHMYou're a delight to talk with. REHMAnd I wish you all good things. ROWLINGThank you, Diane, thank you. REHMThe interview you just heard with J.K. Rowling was originally broadcast on October 20, 1999. It's one of our farewell favorites. And I remember so well the day she came to our studio for this interview. The night before she had been at a book signing at a wonderful bookstore here in Washington, D.C., Politics and Prose. The number of children who showed up to catch a glimpse of J.K. Rowling was overwhelming. There were long lines down the sidewalk, far more people than I believe had ever been expected. So when she came to our studio the next morning, she was completely exhausted. She couldn't even shake anyone's hand because hers was literally aching from all those hands she'd shaken the evening before. REHMBut despite all this, she could not have been more gracious to each and every well-wisher here at the station. She mentions at the close of this interview that she considers the highest compliment to be told by a parent that her books made his or her child read really for the first time. Inspiring young readers was certainly important at the time, 1999, and so perhaps especially important now, given the online explosion that's taken place in the 17 years since. Kids today have so many electronic devices for entertainment, but her stories continue to inspire children to pick up a book and read.